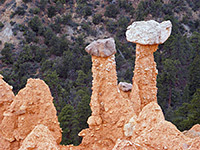 The Hat Shop is a small group of narrow, eroded, orange-colored pinnacles topped by wider, grey boulders, found quite far below the edge of the plateau in the north section of Bryce Canyon National Park, surrounded by generally wooded land. 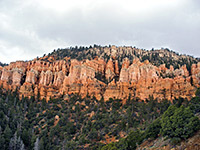 Although the rocks are not particularly special, the 2 mile hike to the Hat Shop passes varied scenery including a band of larger formations more typical of the park, and has extensive views eastwards over the upper Paria River valley, the Kaiparowits Plateau and across to the distant Aquarius Plateau. 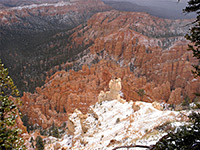 The path starts at Bryce Point, at the southern edge of the most visited section of the park, but is much less traveled than other trails a little further north so is more tranquil; the only negative points are that no loop hike is possible, and the return is consistently uphill, gaining 1,000 feet quite steeply and without much shade. 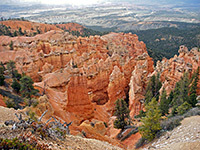 Trail map for Bryce Canyon. The path to the Hat Shop is also the first part of the 23 mile Under-the-Rim Trail, by far the longest trail in the park, which follows mostly beneath the rim all the way to the southernmost overlook at Rainbow Point. 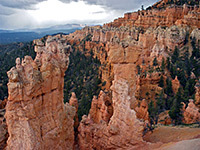 From the parking area at Bryce Point, the route descends a short distance to a junction with a connecting path to the Peekaboo Trail then turns south, crossing flattish land of scattered pine trees and manzanita bushes. The rocks, where exposed, are from the light grey White Limestone Member of the Claron Formation, but this soon gives way to the familiar oranges and pinks, as the path starts to descend more steeply, arriving at the edge of quite an impressive array of eroded pillars. 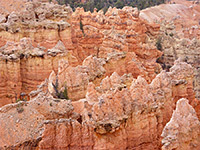 On the right are several narrow gullies filled with nice, varied pinnacles, while to the left is a more extensive area of hoodoos beneath Bryce Point. The Hat Shop Trail descends through the exposed strata of the Pink Cliffs, switchbacking down over some areas of pure rock, without any vegetation, then passes the lower edge of the eroded layer, where the land becomes bushy and quite overgrown, still showing patches of brightly-colored earth though without any more pinnacles. Ahead and below stretches a vast landscape of ridges, valleys and plateaus, from Tropic in the north to Paria River and Grand Staircase Escalante National Monument in the south, and high mountains on the horizon, up to 100 miles away. The well marked path turns back west, curving around the head of a wide ravine (Merrill Hollow) for half a mile, then follows the top of a narrow ridge, on the south side of which are the Hat Shop rocks, extending about 600 feet. The ground drops off steeply below, so the rocks can only be viewed from above - the hillside is too steep and unstable to climb down amongst the base of the pinnacles. This restricts photography somewhat though the trail does offer alternative, if distant views, as after descending another 400 feet over half a mile, it curves back round opposite the formations. Most people just walk to the top of the rocks, however. 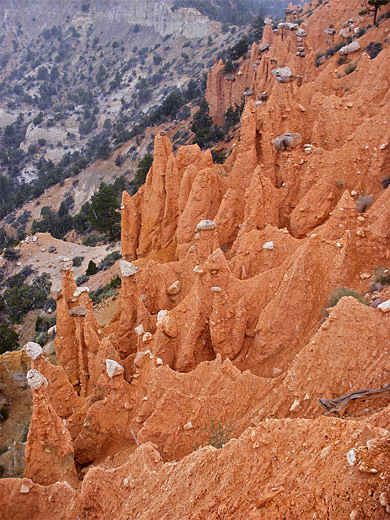 The resistant white caprock is a type of dolomite, delaying the inevitable erosion of the much softer orange-brown conglomerate below.